Identifying Costume Jewelry is hard enough for the seasoned jewelry investor so if you're a new kid on the Antique Costume Jewelry block, this resource on Costume Jewelry might just pique your interest. Costume Jewelry Designers Part 1 are listed in alphabetical order and the subject is divided into Two Parts. Identifying Costume Jewelry Part 2 continues to circle the sciences of the finest costume jewelry designers of the time and the unique methods of construction and materials, employed in the designer's "signatures". The information will be of benefit in the identification of authentic Designer Costume Jewelry in general. As you advance, you'll develop a certain kind of "expertise" in identifying costume jewelry, according to the particular designer's preferences, what I call, their individual "signatures" which is a different thing altogether to their jewelry marks. Inspect the jewelry all over for any signs of damage, missing stones, flat or discolored stones and chipped enamel. Check to see if the piece is signed or not signed. Costume jewelry is not always signed. Many unsigned pieces are extravagant, beautiful, rare and valuable. Elsa Schiaparelli did not sign her work before 1930. Miriam Haskell, Chanel and Elsa Schiaparelli set trends for the rest of the fashion world to follow. 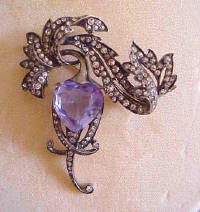 Eisenberg started as a clothing company that made pins that were everything to an evening dress. As the pins proved so popular they were then sold separately. Fine materials include swarovski rhinestones. Early 1940s figural pins are very collectible. Rhodium plated metal with prong and bezel settings were popular. 1930-45 pieces are marked "Eisenberg Original" and after 1945 "Eisenberg Ice." The company was founded in New York by the son of a Parisian goldsmith. Materials included vermeil (gold plated silver), platinum, pastes and semi-precious stones. 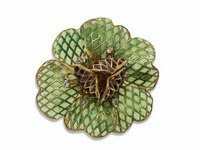 Exotic designs and reproductions of historic pieces owned by European royalty. Marcel Boucher learned fine jewelry skills from working for Cartier and his pieces are so well made they are often mistaken for the real thing. 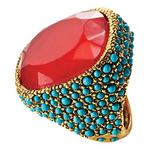 French by birth, Marcel Boucher became one of the finest US costume jewelry designers and makers. Innovative designs use exquisite metalwork, rhinestones in cuts and colors that resemble precious gemstones and colorful enameling. The colors of enamels are expertly shaded. 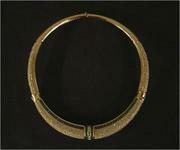 Costume jewelry by Boucher may be marked "MB", "Marboux", "Marcel Boucher" or just "Boucher." Many pieces are competitively priced, even undervalued and as such, represent an excellent investment. Eugene Joseff designed jewelry for Hollywood film studios and sold copies to star-struck fans. The majority of pieces feature "Russian gold" a semi-matter copper-gold finish that minimized flare under the studio lights. Most pieces are signed but beware of bright examples. When you're identifying costume jewelry, by Eugene Joseff, have in mind that the value plummets if polished. If the signature is in block letters it indicates the piece was made in the 1930s or 40s. Christian Dior's "New Look" transformed fashion after World War II. Jewelry was an integral part of his collections. Early pieces were made in small numbers for particular outfits or clients. Later pieces made under license in greater numbers with unusual pastes and stones. Most pieces are signed and dated. Quality of stones and settings are always striking. For three generations, The Gripoix family has made poured glass jewelry under its own name and for fashion houses, Chanel- Costume Jewelry and Dior since the mid-1920s. The company's skill with the poured glass technique means it can create both subtle and vibrant colours with varying degrees of translucency and opacity. When identifying costume jewelry by Chanel from the early 1990s onward pieces will be marked Histoire de Verre. Bright, bold, elegant and affordable designs. Lane began making jewelry in 1963. Pieces made up to the late 1970s are most collectable. Kenneth Jay Lane's "cinderella" philosophy -"Wearing costume jewelry is like wearing glass-slippers. You can feel like you're going to the ball, even if you're not." Distinctive combinations of materials and re-interpretations of traditional styles. Clever re-workings of many traditional styles, including Greco-Roman, Egyptian, Medieval and Renaissance, through to Art Deco and Asian. Stones usually show exceptional depth of color. Signature before 1970 is "K.J.L. ", after 1970 "Kenneth Jay Lane" or "Kenneth Lane." Elsa Schiaparelli founded a fashion house in Paris in the early 1920s and drove costume jewelry to the cutting edge of fashion. When identifying costume jewelry by Schiaparelli look for costume jewelry which is quirky, surrealist-inspired, highly stylized designs. Many of Elsa's design were inspired by the milky way, planets and celestial lights. Her uncle was the famous Italian astronomer Giovanni Schiaparelli who discovered the canals of Mars. 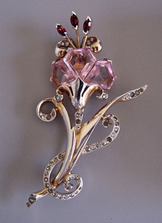 From the 1950s she was based in New York and made abstract or floral jewelry designs using colorful stones and glass. Her signature color was "shocking pink" at a time when Coco Channels' little black dress was still de rigueur. Early pieces are usually unsigned;later pieces are signed. Many fakes have been produced. This highly successful company is renowned for its exquisite floral, foliate, fruit or figural designs using Australian crystal rhinestones. There is a lot of fake Weiss costume jewelry on the market. Find out more about the Weiss deception HERE. Settings may be antiqued gold tone. Convincing reproductions of german smoky quartz crystals known as "black diamonds". Stones set in gold and silver alloys may be enameled or in 1960s japanned (dull black). Undervalued for years, prices are going up! Joseph and Louis Mazer, from late 1927 in New York City, made affordable, simulations of expensive jewelry. In 1946, Joseph set up his own company, marking his work "Jomaz." When identifying costume jewelry by Mazer, have in mind that early pieces were designed by Marcel Boucher before he established his own company in 1934. Popular designs included, floral, foliate, ribbon-and-bow-motif accented with fine "Sea-Maze" faux pearls or the best Austrian rhinestones. Stones are in sophisticated cuts and settings. 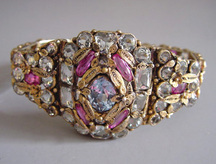 Pieces remain relatively affordable, according to Judith Miller, Collector's Guides, Costume Jewelry, 2003. Miriam Haskell helped to make costume jewelry as prestigious and even more fashionable (according to some people) than fine antique jewelry. Celebrities as well as ordinary people from all walks of life have sought Miriam Haskell costume jewelry to treasure and wear. When identifying costume jewelry by Haskell, components will include fake pearls and roses montees (flat-backed rhinestones in clusters). Pearls are attached to a gilt metal chain. Innovative and complex hand-wired pieces created by a team of designers. Missing rhinestones and damaged pearls will substanially detract from the value of fine costume jewelry by Miriam Haskell.